You’re standing in an empty office, previously the nerve center of your big business dream. Your colleagues, your employees, didn’t come into work today because there is none, not anymore. In fact, they haven’t even come in all week, even just to say goodbye. All the furniture got taken away yesterday (someone made a killing on that stuff, great quality, and real, yes, real leather). The computers got picked up by the leasing company yesterday too, so the place looks barren. No dreams here. Not anymore. Only two things have been left, not yet touched. A wastebasket and a document. Sat forlornly on the floor, smack in the center of the otherwise empty office space. All you need do, as your final act, your departing gesture, is to drop one in the other, walk out of the door, passing the keys to the place over to the waiting building manager as you go. And he’s getting a little impatient. The document is beautifully bound in more real leather, with your company logo expertly embossed on its cover, along with just two simple words, “Marketing Strategy.” The wastebasket is what it is. It’s a frightening scenario, don’t you think? If you did professionally print out your marketing strategy, and then have it professionally and expertly bound, there is one consolation. They can recycle paper now. Actually, it’s not just frightening; it’s a real nightmare for many owners of startups and small businesses. The objective of this article is to ensure that nightmare doesn’t become cold, brutal reality, that your all-important Marketing Strategy has been envisaged for the long-term, is sustainable, and is capable of consistently and reliably driving your customers straight to you. Furthermore, this article will not guarantee success. Now that’s honesty. 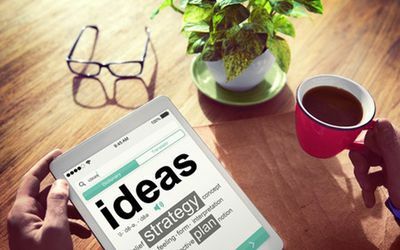 However, it’s the best starting point; what follows are the very latest of those ideas, concepts, and strategies you’re looking for, that, time and again, have proven themselves to be the core elements of successful marketing approaches. Before we begin, let’s make one thing clear. From now on, whatever it is that will generate revenue for your business will be called the “product.” It may be a simple idea, a 100%-original concept, a laundry service, an app that washes your car at the weekends, or a hi-tech golf club that actually talks to you, offering professional coaching advice (even though it sniggers when you miss the fairway). It doesn’t matter. It’s the product. It’s your product. Right, stop reading this article and watch a video. Yes, that’s right. Watch a video. This one: “The Art of Innovation,” by Guy Kawasaki, renowned U.S. author, marketing expert and venture capitalist, opening the Berkeley TedX of 2014. It’s ok. You’ll come straight back here. Now, that’s called belief. Belief is something you really need to have in your product. Actually, it’s not simple need – this belief is essential. 1. Make Meaning: Your beginning, the start of this new enterprise, needs to be this concept: It’s not about making money, it’s about making meaning. If you can achieve that, the revenue will follow. 2. Create a Mantra: A mantra, not a slogan, will succinctly put into words the core, the essence, of your brand. 3. Jump to the Next Curve: Never stagnate. Always look to jump to the next innovative step, giving your customers another quality experience. 4. Roll the Dice: Keep producing products, focusing on intelligence, fullness, empowerment, and elegance. 5. Don’t Worry – Be Crappy: It’s ok if your product isn’t perfect, as long as it’s revolutionary. 6. Let 100 Flowers Blossom: Your customers decide your direction, not you. 7. Polarize People: Not everyone will fall in love with your product, and that’s ok.
8. Churn Baby Churn: Keep evolving your product. 9. Niche Thyself: Your product has to be highly unique and highly valuable. 10. Perfect Your Pitch: Be audience[specific, with a customized intro. Use the “10-20-30” rule (10 slides maximum, presented in 20 minutes, with an optimal font-size of 30pt.). The core foundation of your marketing strategy has to be this: My product will change the world. If that belief, as certain in your eyes as the sun rising tomorrow morning, isn’t there yet, then put it there. Make it your belief. If you can’t, then go work for someone else who does truly believe in their product. The most vital element of your marketing strategy is getting your customer to use and publicize your product. Simple, but vital. We now live in a world where social media is king. If you can inspire, impress and get people feeling good about your product, they will share. And share again. Those people, those customers, will become an essential business marketing tool for others who have not heard about your product, as well as being an audience that promotes you online. Through the loyalty you build up with them, they will become an “online influencer” for your brand, your product, and your business. Social Currency: Online appearance is highly important to the average consumer. Therefore, make your product a “symbol of status,” and make them look intelligent for buying it. Emotion: When we care, we share. So make your customers care about your product. Public: Your product needs to be easily available and attainable. Triggers: The use of words or phrases which, by definition, are associated with other thoughts that will lead to your product or service. Stories: Everyone loves stories, especially ones that have morals or lessons or secrets. Your product needs to be the story’s main character. “Marketing is telling the world you’re a rock star. With the power of social media, the word-of-mouth effect described above, and the time people spend online in general, content creation is pivotal in the success of your business. Your content, whatever forms it takes – audio, visual or textual – needs to fully captivate and fully engage the reader. They are a future customer of yours, just waiting to be asked. So just how do you create this “rockstar” content? “Content, Inc.” is a widely-acclaimed book on this very subject, written by Joe Pulizzi, a pioneer in the field of content marketing, and founder of the hugely successful Content Marketing Institute (CMI). His 6-point creation model is a proven success, ensuring businesses across the world are reaching their goals. In summary, Pulizzi describes hitting “the sweet spot,” where your expertise, your skills, intersect with a particular “customer pain point.” By narrating the problem and demonstrating your solution through your content, you become the expert in this niche. Check out this – the “Content Marketing Playbook” from CMI. Great tips for creating your rockstar content. If it’s good enough, you’ll build followers to this, which you need to turn into subscribers to your brand. How do we generate that all-important revenue? Is through just the products and services we currently offer? By following his model of building that essential audience first, then generating profit second, as a business, you’re walking before you run. Just remember, this model requires a long-term approach to content creation. Rewarding customer loyalty, offering them a feel-good experience through a gift, can be more productive than that hugely expensive TV marketing campaign. Corporate Gifting is the tool for thanking the online influencers in your audience. And guess what happens next? Yep, you’ve got it. They share that, too. Using corporate gifts to reward customers represents a fraction of what a full advertising campaign would set your business back. Remember, a full page ad in every local paper is not going to provide a feel-good experience for anyone, but a unique and useful product such as a business notebook or journal as a corporate gift for loyalty will. Fact. That, dear reader, is exactly what you want. You simply cannot do it without them. What are your perceptions of these 5 core elements of successful marketing? What strikes you as fundamental to achieving business success? Please share your comments with us below. Now, that all-important question. Do you believe?